Last major update issued on February 8, 2004 at 04:20 UTC. The geomagnetic field was very quiet to unsettled on February 7. Solar wind speed ranged between 418 and 554, gradually decreasing al day. Solar flux measured at 20h UTC on 2.8 GHz was 111.1. The planetary A index was 11 (STAR Ap - based on the mean of three hour interval ap indices: 11.1). Three hour interval K indices: 22333320 (planetary), 23323221 (Boulder). Region 10549 developed early in the day, then began to decay. At the current rate of decay this region could become spotless within a couple of days. Region 10551 developed slowly with most of the development occurring in the leading and southern spot sections. The The trailing positive polarity field is very close to the leading negative polarity field of the small trailing unnumbered bipolar region., the two regions are likely to merge and there is a possibility of a magnetic delta structure forming at the eastern edge of the large trailing penumbra. A minor M class flare is possible. New region 10554 rotated into view at the southeastern limb and is a quickly emerging region. There is a magnetic delta structure in the leading penumbra and there is a fair possibility for a minor M class flare. 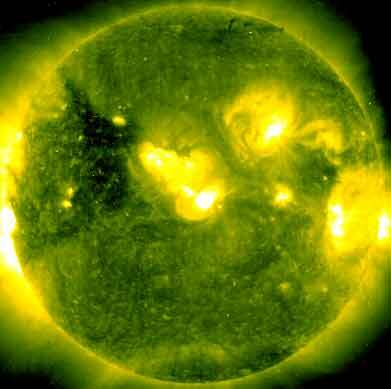 Flare: C2.5 at 13:26 UTC. 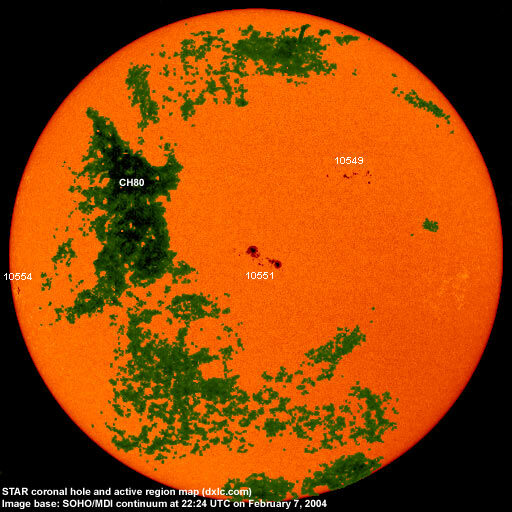 February 5-7: No partly or fully earth directed CMEs observed. A recurrent trans equatorial coronal hole (CH80) will rotate into a geoeffective position on February 9-10. 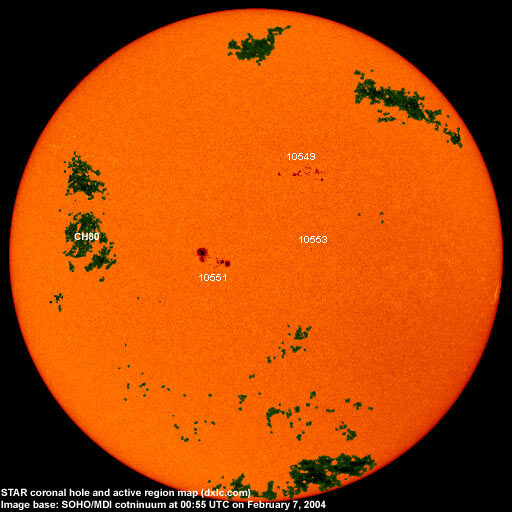 The geomagnetic field is expected to be quiet to unsettled February 8-11 and unsettled to active on February 12-13 due to a high speed stream from coronal hole CH80. Long distance low frequency (below 2 MHz) propagation along east-west paths over high and upper middle latitudes is poor to fair. Propagation along long distance north-south paths is poor. [Trans Atlantic propagation conditions are currently monitored every night on 1470 kHz. Dominant stations tonight: Radio Cristal del Uruguay and Radio Rafaela (Argentina) and the southwesterly longwire, Radio Vibración (Venezuela) on the northwesterly EWE. Quite a few stations from the northeasternmost parts of Canada and USA could be heard on frequencies below 1200 kHz].